If you suffer from plantar fasciitis then you know that shoes with good arch support are absolutely essential especially when you plan to spend long hours on your feet walking. Don’t let heel pain ruin your trip! We’ve got an incredible list of the best shoes for plantar fasciitis according to our readers. You asked and they shared their top recommendations. Find out what they are! What are the brands our readers rated as the best shoes for plantar fasciitis? How to choose the right shoe if you have plantar fasciitis? Travel Fashion help! A Reader Asked: I’m going to Ireland, London, and Paris for 5 weeks. I’m looking for advice on a shoe that can go with shorts and skirts. I also have plantar fasciitis and will be doing a great deal of walking. Can you please recommend the best shoes for plantar fasciitis? CLICK TO READ GENERAL TIPS ON CHOOSING THE BEST SHOES FOR TRAVEL. We get numerous questions with travelers in similar situations. They want to know what shoes are best for plantar fasciitis so we asked our readers for their recommendations. This article features all their top choices along with their best tips. As plantar fasciitis (or PF) sufferers know, choosing shoes that are comfortable and relieve (or don’t worsen) heel pain can be difficult. And there’s nothing worse than having sore feet while traveling! It can ruin a trip. Because many of our readers suffer from this painful foot problem, we reached out to our readers for their first-hand recommendations for the best plantar fasciitis shoes. Tip: Packing Cubes make the perfect shoe bags to protect your luggage from dirty shoes! This list includes everything from sandals, sneakers, hiking shoes, and flats, so you’re sure to find something that fits your style! You can read more of these brands and specific styles our readers recommend below. 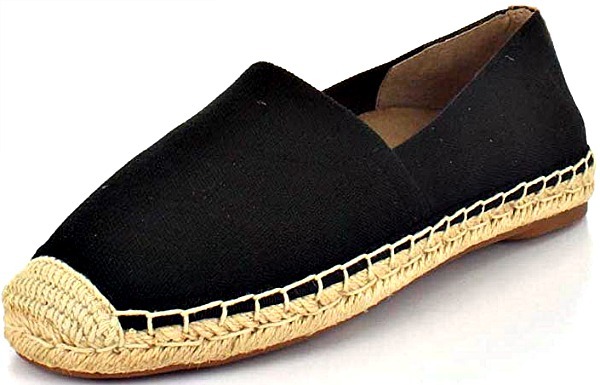 Vionic Valeri Espadrilles | Buy now! When we asked our readers to recommend the best shoes for plantar fasciitis, Vionic was definitely the top choice. They overwhelmingly mentioned Vionic as their favorite brand, saying they could walk for hours and hours with their feet feeling great. They singled out Vionic’s flip-flops, flats, and even a heeled boot! Vionic was founded by a podiatrist who wanted to create comfortable shoes, especially for people with PF. The brand continues to come out with more and more attractive footwear options that are also comfortable for long days of walking. Vionic is also featured as one of the best sandals for travel! We love Vionic for their balance of comfort with fashion – the Valeri espadrilles above are our latest shoe obsession! Watch this video to see our review! I wear sandals and even the flip-flops and can walk and walk and walk. I have the Vionic Paden sandals and Dansko Heidi sneaker. I walked 10+ miles/day with both of them last summer in London, Lisbon, and Madrid. I also have plantar fasciitis and these saved me from aching feet after long days walking and sightseeing. I’ve worn my Vionic Tide II flip flops (shown above) all over Greece, Croatia, and Fiji and they are the best! They are all that I can really wear so my feet don’t hurt… As long as you’re not rock climbing, you’ll LOVE them! After discovering Vionics my other shoes barely get any love. Having no foot pain after a long day is amazing. I have 2 pairs of the Upton ankle booties, Surin ballet flats, and the Caballo flat in the black snake. I love my Vionics! I have PF and fallen arches, and Vionic fits my foot well and offers good arch support. Skechers Go Step-Seashore | Buy now! The GOwalk line isn’t just slip-ons any more—they include lace-up boat shoes, sneakers, flats, and more, in tons of colors and patterns. The styles are continuously evolving, which is why we think they make for some of the best shoes for plantar fasciitis. Find more of our readers’ top picks for the best travel shoes here! Readers love that Skechers Go Step-Seashore are super light and have a thick but bouncy sole that cushions the feet, allowing you to walk for hours in total comfort! I have plantar fasciitis and live in Skechers GOwalks when I travel. They go with shorts, skirts, dresses, or pants. I waterproof them and they dry out very quickly if they do get wet. And so comfortable! Co-sign the Skechers: bought a pair for my first trip to Paris this February … they did not disappoint. I rely totally on my Skechers when traveling. Walking so much on hard surfaces means you need as much cushioning as you can get. I just survived 2 weeks in Prague/Berlin/London with non-stop walking on hard pavements and cobblestones. No sore spots or blisters. 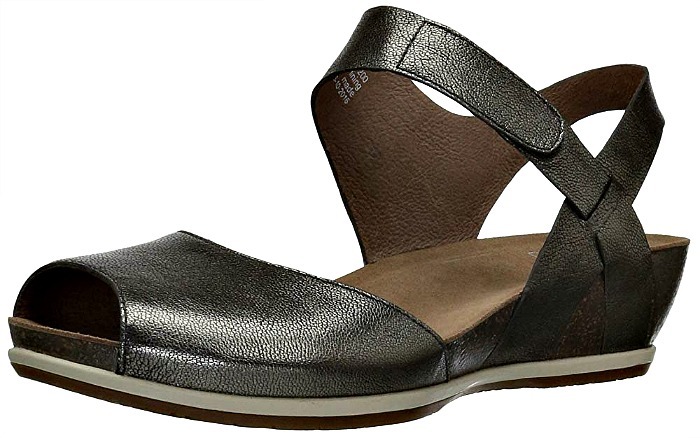 Dansko Vera Sandal | Buy now! The Pennsylvania-based company Dansko is more than just clogs! Recently they’ve been coming out with lots of new styles of footwear that are very high quality and comfortable. TFG readers love their sandals and sneakers for hours of exploring new destinations, ranking them as some of the best shoes for plantar fasciitis. Find out why Dansko is one of the most fashionable shoes for women over 60! The Vera sandal shown above seamlessly merges fashion and functionality together, with a supportive sole and a simple yet classy appearance. The ankle straps and gorgeous leather material allow these to work from day to night as well! I have a great pair of Dansko that I could walk miles in. I have the Dansko Heidi sneaker and the Vionic Paden sandals. I walked 10+ miles/day with both of them last summer in London, Lisbon, and Madrid. I also have plantar fasciitis and these saved me from aching feet after long days of sightseeing. Keen Whisper | Buy now! Do Keen make some of the best shoes for plantar fasciitis? Our readers say YES. This was the third most mentioned brand. Aside from athletic sandals, keen also offers some cute and casual flats and sneakers. PF sufferers say that those shoes make their feet happy, and what else could you ask for while traveling? Keen Sandals are some of the best womens outdoor sandals you can buy! 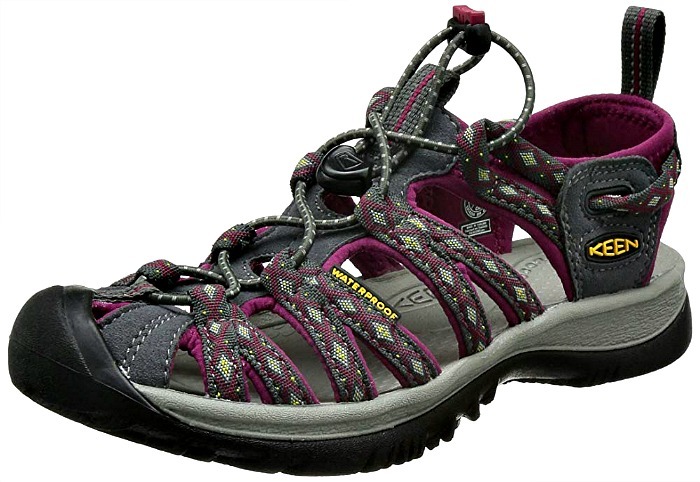 Keen’s most known for its recognizable adventure sandals like the Keen Whisper shown above. If you’ll be hiking in a warm destination, these are perfect! Their rugged, outdoorsy hiking sandals are great in wet terrain and rainy weather, too. Keen Whispers have taken me through glaciers, mountains, Paris streets, and more! I like Keen for their Mary Jane-style walking shoes! For plantar fasciitis, my doctor gave me the choices…1. Surgery, 2. Cortisone shot, or 3. Keens. Guess what I chose? 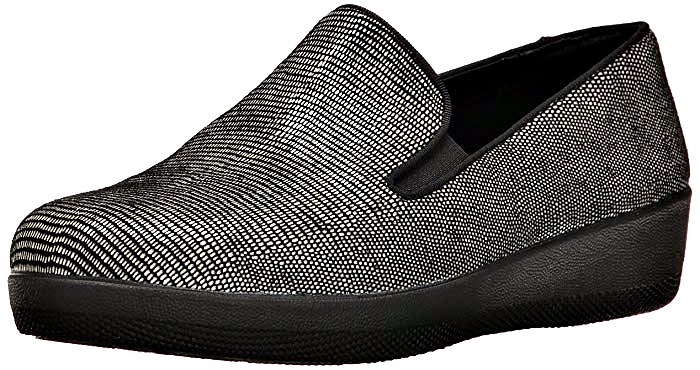 Fitflop Superskate Loafer | Buy now! TFG readers mentioned Fitflops “microwobbleboard” insole technology, which is especially loved by plantar fasciitis sufferers. Fitflop’s shoes help accentuate the rolling motion of the foot from the heel to the toes, which supports the arch, cushions the foot and gently stretches the plantar fascia. This genius technology makes your feet feel good all day and ready for the next adventure! Traveling to a hot weather destination? Read our full list of the best beach sandals–it includes Fitflops too! We love the look of the Superskate Loafer shown above without socks, but it’s not always the best option if you want to keep your feet comfy and fresh. Instead, pack a pair or two of these no-show shoe liners to wear with your low-cut shoes. My favorite right now–fashion-statement and feel-wise–are a pair of the Superskate loafers. Three cheers for the super skates! I swear by my Fitflops Sandal for my plantar fasciitis relief. They have non-flip flop styles that can work with skirts. Since I started enjoying their ‘Microwobbleboard’ technology, I haven’t had a twinge. Naot Sabrina Flat | Buy now! The Israeli brand Naot is getting more and more popular for their comfort and increasingly stylish footwear. The Sabrina sandal hits all the right marks, and continues to be a TFG favorite. 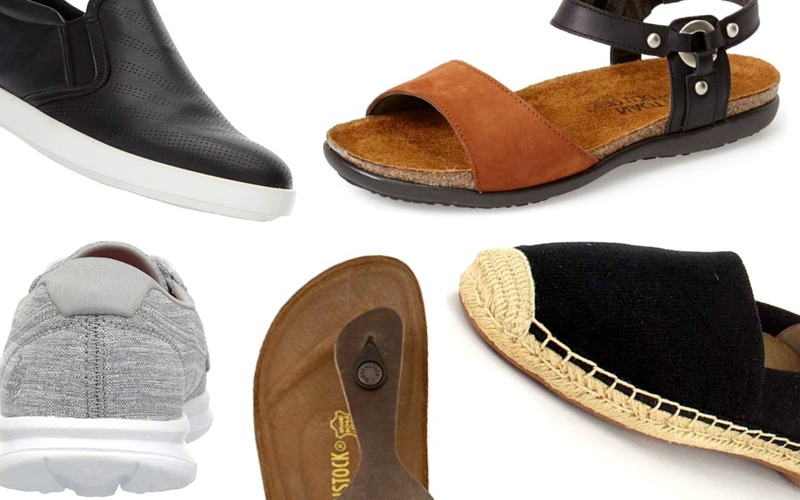 Here are more comfortable walking sandals that are stylish, too! Naot makes a comfy and cute Mary Jane that I wore with jeans, capris, skirts, and dresses when I traveled to London and Paris years ago. They became one of my favorite shoes and I recently bought the same shoes to replace my old pair when they finally wore out. I have custom orthotics and love my Naots for their removable insoles! The Naot Rongo is expensive but worth it! For plantar fasciitis, I strongly suggest sandals by Naot or Keen. Look for the sandals with removable insoles. Both shoes have insoles that will conform to your foot. Naots are the best for plantar fasciitis. They kept me on my feet when walking became nearly impossible. ECCO Chase II Tie Sneaker | Buy now! From performance hikers to city styles, Ecco boots, shoes, and sandals are made for any travel destination, including outdoor adventures in the concrete jungle or the wilderness. ECCO uses advanced construction techniques and continuous exploration in materials science to develop the most comfortable shoe. Ecco is the top one among the twenty brands our readers voted as the most comfortable and cute walking shoes for travel! With ECCO, you know you can count on superior fit, durability, support, and flexibility for all-day comfort. This pair has a wonderful insole: firm but cushioned, and they get more comfortable and shape around your foot as you wear it. I have had Plantar Fasciitis and I am terrified of having it come back. These shoes give all the arch support I need and protect my heels without buying additional orthotics. 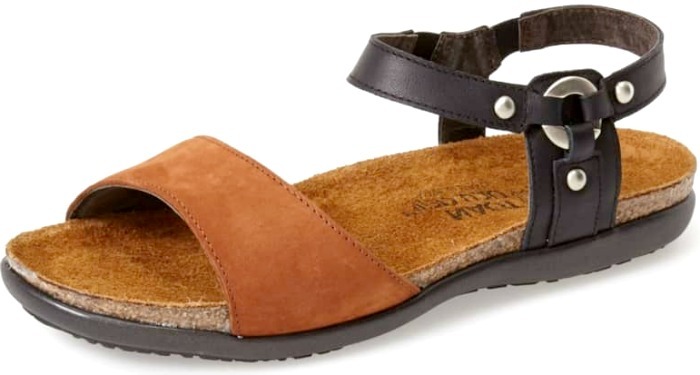 Clarks Lucena Sandal | Buy now! British-based brand Clarks are well-known for having comfortable shoes of all types. It’s no surprise TFG readers loved them for helping with heel pain and keeping feet comfortable after full days of walking! Clarks offers a full range of styles, including everything from sneakers, boots, wedges, sandals, and more, making them some of the best shoes for plantar fasciitis. If you are looking for the most comfortable wedge sandals, look no further than Clarks! I have a pair of Clarks sandals that I wore everywhere! So comfy. You can’t go wrong. My favorite pair of sandals was from Clarks. I wore them all over Italy. Plus, they were super cute—I got lots of compliments. I wore them until they started falling apart and wished I’d bought more of the same pair before they stopped making that style! I love Clarks for walking a lot. I have very princess-y feet and they never give me so much as a red spot. I love them! OOFOS Ooriginal Thong | Buy now! Some readers mentioned Oofos, which is a recovery shoe, as the best shoes for plantar fasciitis. So after exploring Rome for hours, slip into some Oofos while lounging in your hotel to rejuvenate your feet for tomorrow! Check out their other styles on Amazon! They are engineered to help feet recover by absorbing shock and reducing stress on your feet after a long day, which is ideal for people with plantar fasciitis. I recommend taking along a pair of Oofos. I keep a pair by the bed and never walk barefoot. These might save your feet one day on your trip. Get some Oofos flip flops for after hiking walking. They are life changing. I sprained my ankle and fractured my foot and deal with plantar fasciitis. 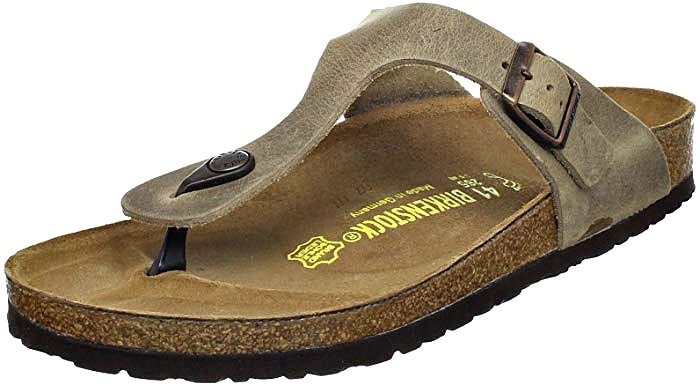 Birkenstock Gizeh Thong | Buy now! In recent years, Birkenstocks have again become popular…but did they ever really go out of style? This nearly 250-year-old German footwear company uses high-quality materials and their shoes last a long time. They mold to your feet after wearing and eventually fit like a glove, which is why they are some of the best pairs of shoes for plantar fasciitis. Some new, slightly more attractive styles, like the Gizeh, are popular with TFG readers. For PF, Birkenstocks have the needed arch support. Check out our Birkenstock Gizeh review and find out why it’s a must-have travel sandal! Super Feet Premium Insoles | Buy now! Don’t forget about insoles! 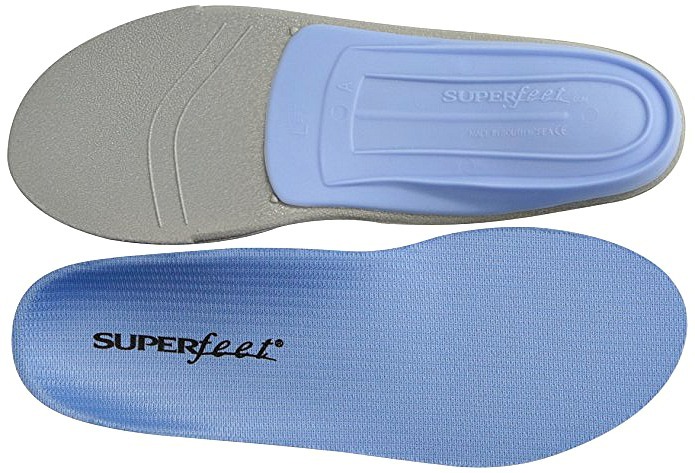 Many readers raved about Superfeet insoles in particular. They stabilize the feet, which helps reduce some of the stress on the plantar fascia. The company website claims to not just remedy plantar fasciitis, but prevent it! Readers love that these insoles come in various colors and levels of support. Consider switching out the insoles in your current favorite shoes with Superfeet and you may find a whole new level of comfort and relief! Insoles can turn regular shoes into the best shoes for plantar fasciitis. I’ve found that if a hiking boot fits good everywhere else, then I can add SuperFeet insoles (or orthotics) for arch support. I use SuperFeet inserts in them both and they really help. They were recommended by my podiatrist. Get Superfeet inserts, as long as the insoles in the boots are removable. I put these into my running shoes and they helped my plantar fasciitis heal quickly. I use Superfeet to replace the insoles in anything from flats to sneakers! I had the best luck surviving two weeks in Prague using green Superfeet insoles. I’ll spend 7 weeks in Portugal, Spain, and France this summer so will switch my Superfeet insoles to my Superga sneakers. Just a note: if your shoe doesn’t have removable insoles, you might not be able to use Superfeet—or you’ll have to buy ½ size larger shoe to accommodate the Superfeet. 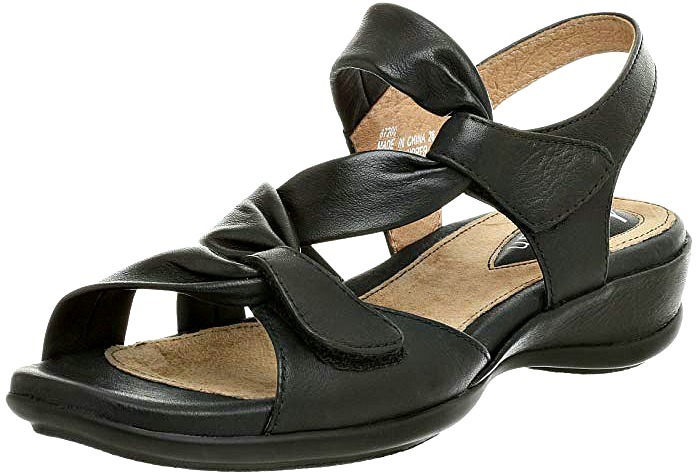 Look for the sandals with removable insoles and heel and arch support. Consider taking an anti-inflammatory pain reliever the night before big walking days. Europe’s cobblestone streets don’t work well with high heels. Try low wedges, an ankle or motorcycle boot, a low hiking shoe with added heel cushioning, or a soft moccasin. Rely on public transit to reduce the amount of walking. Many popular destinations, especially in Europe, have safe, excellent transit. Consider getting customized insoles or orthotics from a footwear store. Remember: quality shoes and insoles may be expensive, but they’re worth it! Tip: Most travelers agree that three is the magic number when it comes to packing shoes. Learn more about how to create a capsule wardrobe with just three pairs of shoes! What do you think are the best shoes for plantar fasciitis? Share in the comments! 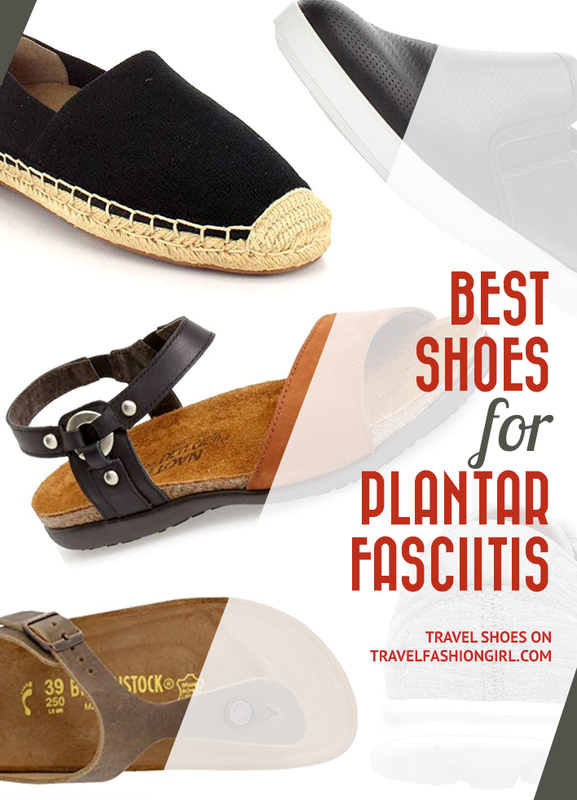 We hope you liked this post on the best shoes for plantar fasciitis. Please share with your friends on Facebook, Twitter, and Pinterest. Thanks for reading! Vionic brand of footwear helped me recover from plantar faciitis together with stretching exercises I learned from you.tube. Stretching your hips down to your toes significantly eased my pain. I experienced agony and pain for 4 months and now I am finally healed. I have been diagnosed w/PF. I have had 1 steroid shot and have been pain-free since. BUT – I have 2 pairs of Vionic shoes, 3 prs of Vionic Tides (used year-round as ‘house shoes’ and I can walk up to 2 miles in them easily!). I also have 5+ prs of Skechers but I still use arch supports in them. I also have a pair of Supr Feet inserts in my running/treadmill sneakers. LOVE them all! For those with narrow feet needing arch support (a nearly impossible category), I’ve had good luck with Taos sandals. They have supportive cork foot beds and adjustable straps for just the right fit. I love their wedges for a slightly dressier look that still works with uneven surfaces! For more active pursuits, my go-to is Chaco sandals. Great support, fully adjustable straps, and perfect for short hikes or splashing through water. I would love to see an article on the best shoes for PF AND very wide feet. I have a lot of trouble finding shoes, especially closed shoes. For casual rubber thongs and a sufferer of PF in one foot I was told about “Archies” thongs. They come with regular and high arch support and are great for people with PF but anyone can wear them. You can purchase on line and can be purchased through some stores listed on their website. They are quite reasonably priced with cheap postage. Are you JILL Ffrom the Australian fashion label ? Suprised to not see Therafit on the list. These shoes seriously have saved my right foot. Amazing comfort level and adjustable. I love my fitflops, I have quite a few pairs, sandles, sneakers, slippers. My first go to for comfort. I also love my merrells for hikers and sport sandals. For all the Australian readers try Frankie4 footwear they have been developed by a podiatrist and a physiotherapist . They come in a huge range to cover every occasion from sandals to sneakers to heels. All are super comfortable and very stylish. I was looking for recommendations for good shoes for individuals with PF and found this post. It’s funny that you have listed here some of my favorite shoes that I currently own or have owned in the past. I look forward to trying out some of the pairs listed here that I haven’t tried yet. While no longer a PF sufferer (knock wood) I was for long enough it put the fear of it in me for life. I can’t tell you how excited I am to find this post. It looks like Vionic is going to be my new brand! I recently had plantar fasciitis in one foot and was a few months away from a 3 week Baltic Cruise. I tried all sorts of different shoes and insoles and nothing was working, but having my foot taped worked for a while. Someone from a shoe store locally suggessted Earthies brand and the Earthies Capri Mary Janes worked for me. I took them on the trip and some New Balance running shoes (not the cheap one’s) and had no problem and walked everyday on trip through excursions. A lot of the insoles have too high of arches for me, but these Earthies were very comfortable and lets your foot breath as well. Great feedback Tawny, thank you! I often get sore feet on vacation but since I got the Skechers Go- Walk and 2 pair of KEEN’s, my feet have never been happier. I also own 2 pair of Clark’s but I don’t think they are quite as cute, however they are great for walking and standing for long periods of time. Have a pair of both Skechers and Ecco which I wear a lot. They have given my feet heaps of arch support for the miles I walk each day as a nurse!! Great list! I found my Vionic sandals to be extremely comfortable for all-day walking, and Clarks are in my office shoe rotation. I wish I had seen those Dansko Heidi sneakers a long time ago, they look adorable and are probably even more comfortable than my Saucony Bullets! I do use the green super feet inserts, but I’m finding them a bit stiff for me — is there a different one you’d recommend? Thanks for your input Melissa! I’ll ask the readers in the TFG Facebook Group if they have any other shoe insert recommendations. I have plantar Fasciitis, stand on a hard floor as I am a teacher. I tend to live in tennis shoes with soft inserts. My foot Dr isn’t going to carry them any more. I recently saw a video where you displayed Vionic, Kenneth Cole and Yosi Samra. What your thoughts on the Kenneth Cole and Yosi Samra and the Superfeet inserts? I would like shoes that I can use everyday and when I travel. Hi Victoria, I love all three shoes from the video but I don’t have plantar fasciitis so I wouldn’t feel comfortable recommending them for this. Just came back from almost two weeks in Norway -lots of walking! I brought the lace up ARA Rebecca shoes and they were so comfortable! Highly recommend that shoe and will be looking for more styles from ARA!